Volatility was broadly subdued, with an intra low of VIX 13.06, but settling -0.9% @ 13.49. Near team outlook is for renewed equity weakness to the sp'2040s, which should equate to VIX 17s. The big 20 threshold looks out of range in the next upward push. 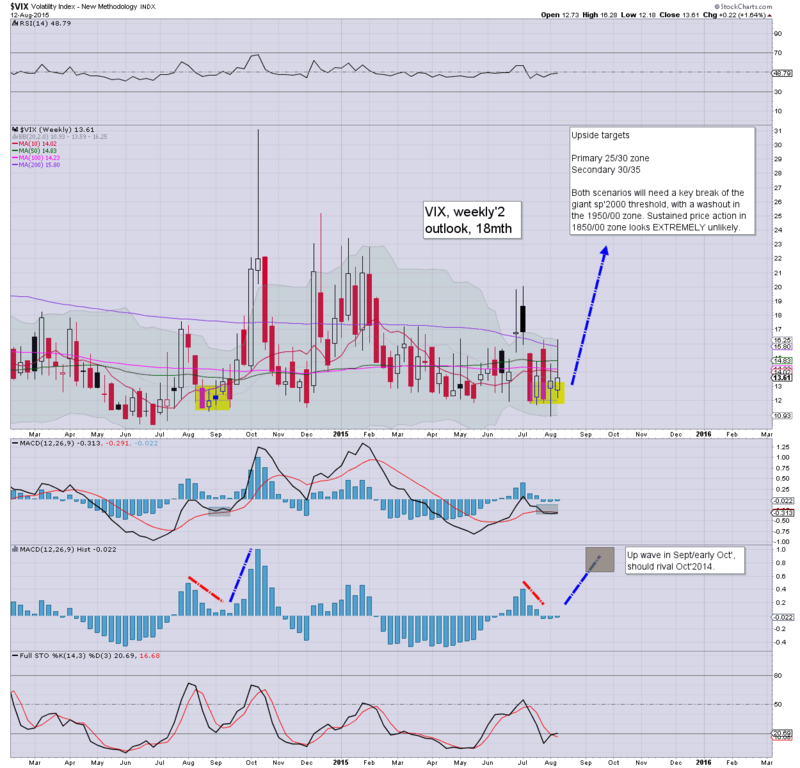 VIX looks set for another upward push tomorrow.. and it might carry over into Monday. *I remain rather heavy long-VIX, seeking an exit into the weekend.. preferably in the 16/17s. 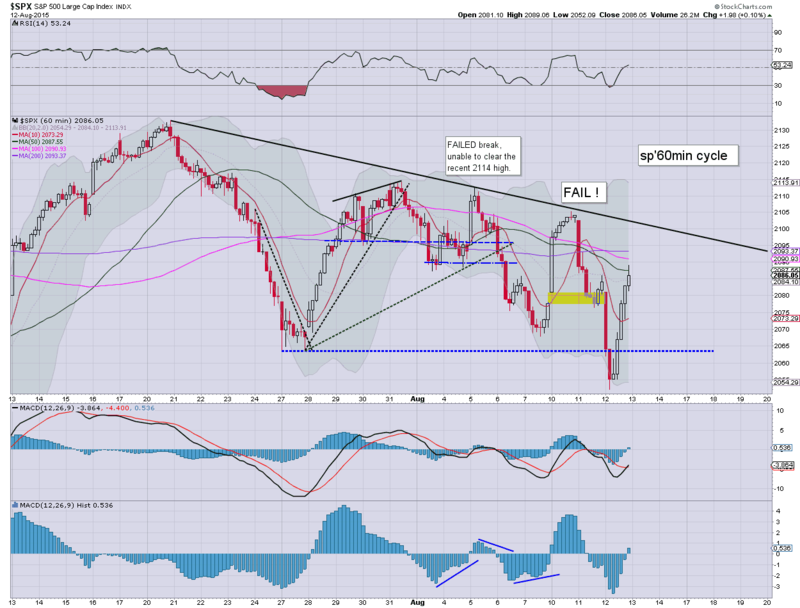 US equities settled moderately mixed, with some distinct weakness in the closing hour, sp -2pts @ 2083 (intra high 2092). The two leaders - Trans/R2K, settled lower by -0.1% and -0.3% respectively. Near term outlook is for renewed weakness to the sp'2040s, which should equate to VIX 17s.. before churn/moderate upside into opex. *closing hour... a clear rollover.... with more significant weakness due tomorrow morning. Frankly, the equity bears should be delighted with how today closed. So... another day closes.. after a fair bit of chop.. but the closing hour offered a very strong hint of what is possible across tomorrow. Best guess.. a marginally lower low in the sp'2040s.. with VIX spiking into the 17s.. before 4-5 days of churn into next Friday's opex. US equities are holding moderate gains, with the sp +6pts @ 2092. Key resistance remains the 2100 threshold, but that looks well out of range today. Equity bears had better show up early tomorrow.. or a weekly close >2100 would cause some problems to the mid term bearish outlook. Hourly equity/VIX cycle remains prone to a rollover, but clearly....... not today. US equities are offering a short term top of sp'2092.. with VIX 13.11. 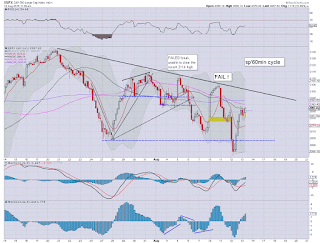 The hourly cycle remains highly prone to another rollover.. much as we saw after the 'Monday nonsense'. Now its a case of how far down can we go. 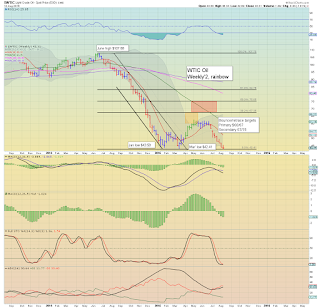 Oil remains notably weak, -2.8%... set to lose the $42s. Perhaps the most depressing day of the year for yours truly. ... not least as around 20 emergency crew are maybe 20 ft from my desk cutting people (dead?) out of crashed cars. I could go on... but for now... no. not having the best 'Thursday the 13th'. 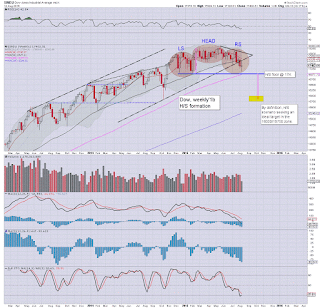 US equities remain choppy.. but now a touch on the positive side. 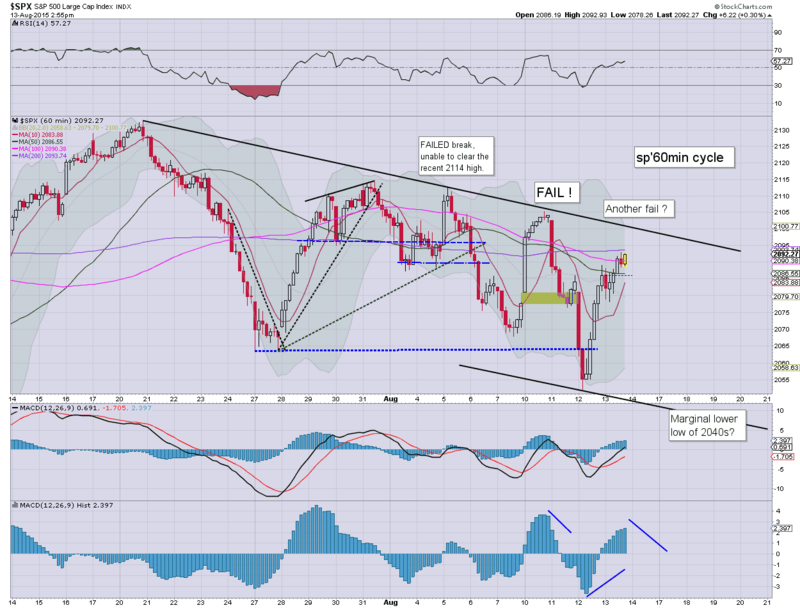 What should be clear, near term key resistance is the sp'2100 threshold. A daily close above 2100 would bode in favour of the bulls.. otherwise.. the next rollover will break a marginal lower low in the 2040s... which would likely equate to VIX 17/18s (as ever...briefly). *note the weekly chart... bears really need to get a Friday close back under 2080 has been offering some support in the previous four weeks. A difficult day for yours truly... and it is not in the least bit because the VIX is in the 13s. US equities remain in minor chop mode, stuck within the 2078/88 zone. 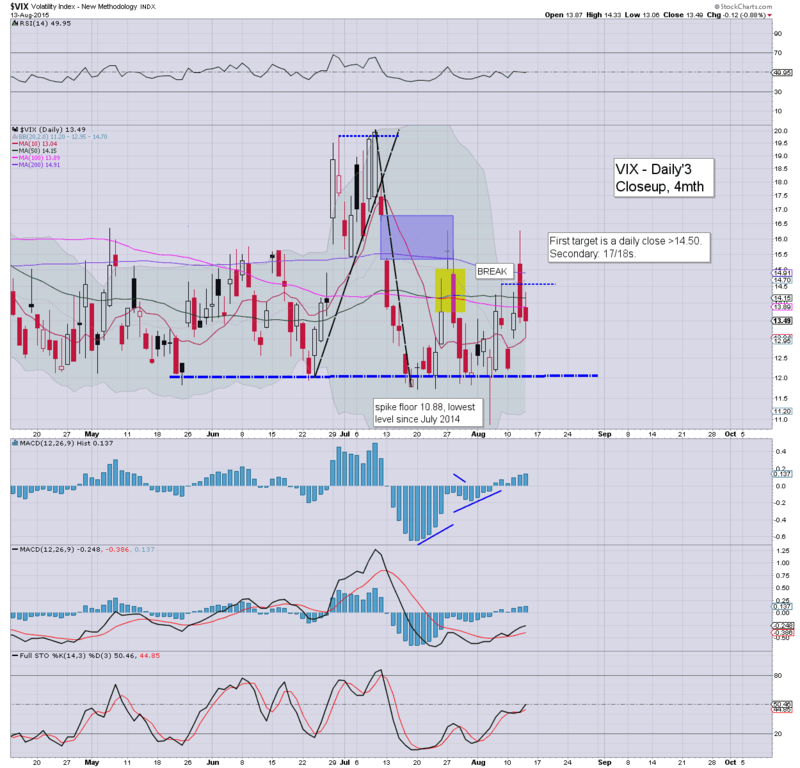 VIX is naturally subdued, having cooled from an early high of 14.33 to the low 13s. USD is holding moderate gains of 0.2% in the DXY 96.40s. Metals remain weak, Gold -$8, whilst Oil is -2.4% in the $42s. Equities remain choppy, having made an early low of sp'2078 (with VIX 14.33). Hourly equity/VIX cycles are still setup in favour of the bears, with a more sustained break lower tomorrow. For now, unless the bulls can break/hold >sp'2100... and take out the previous lower high of 2112, nothing has changed. A choppy morning so far... as Mr Market is battling to pick a direction. Busy morning in my world..........back at 12pm.. US equity indexes open with some moderate chop... leaning on the weak side. 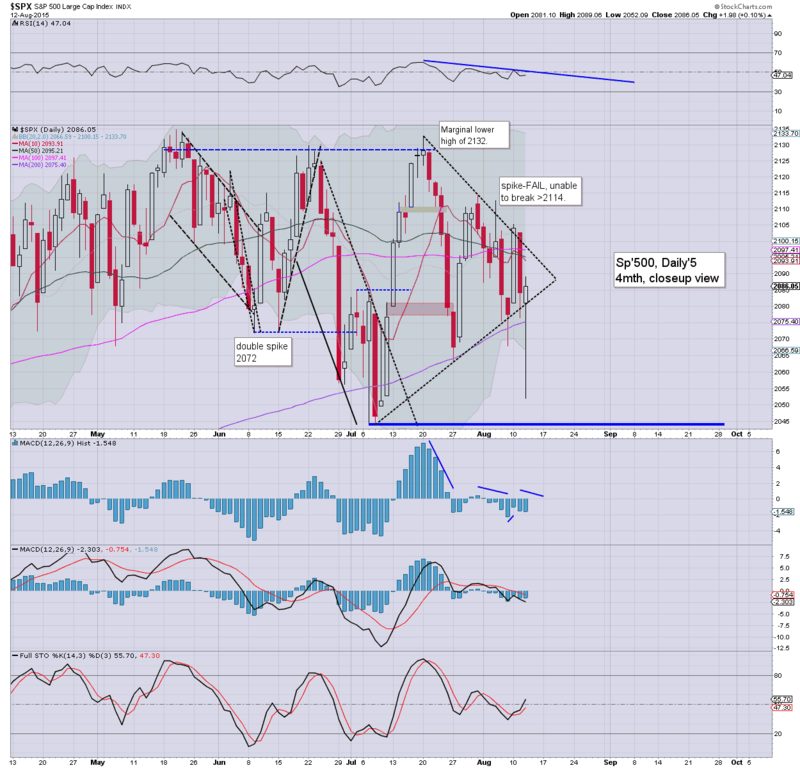 A break back under sp'2070 looks viable today, along with VIX back in the 15s. Things only get interesting on a daily close in the sp'2060s.. along with VIX 16s. 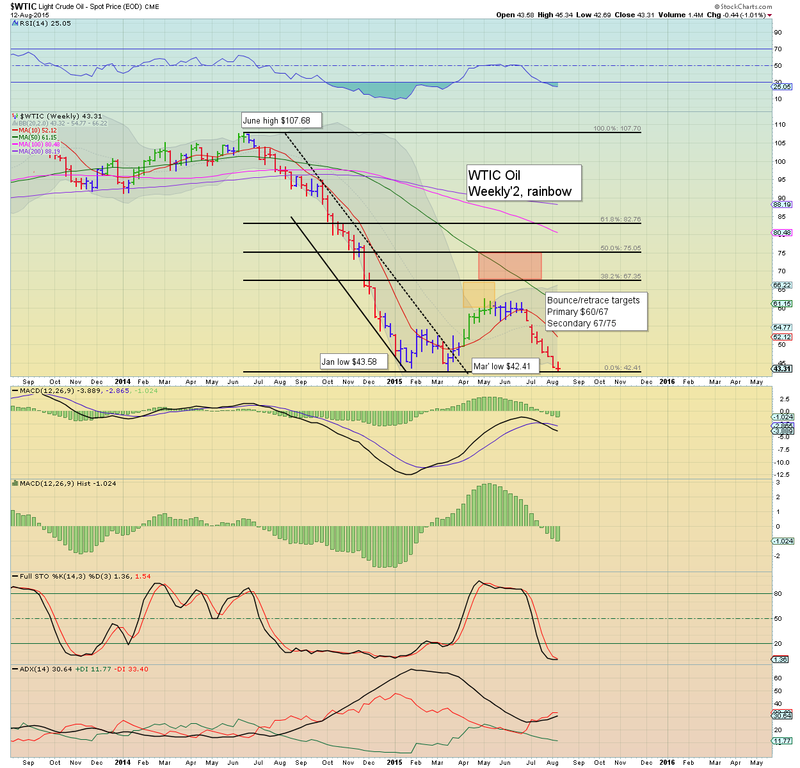 Oil is notably weak, -1.8% in the mid $42s. 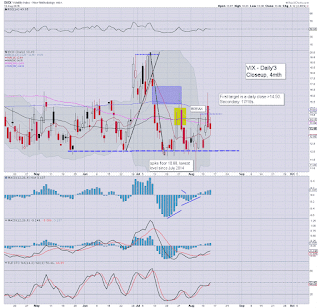 *note the third consecutive green candle on the VIX... the 17/18s look due.. if sp'2040s. From a pure hourly cyclical perspective, the setup favours the bears across today, and particularly tomorrow. 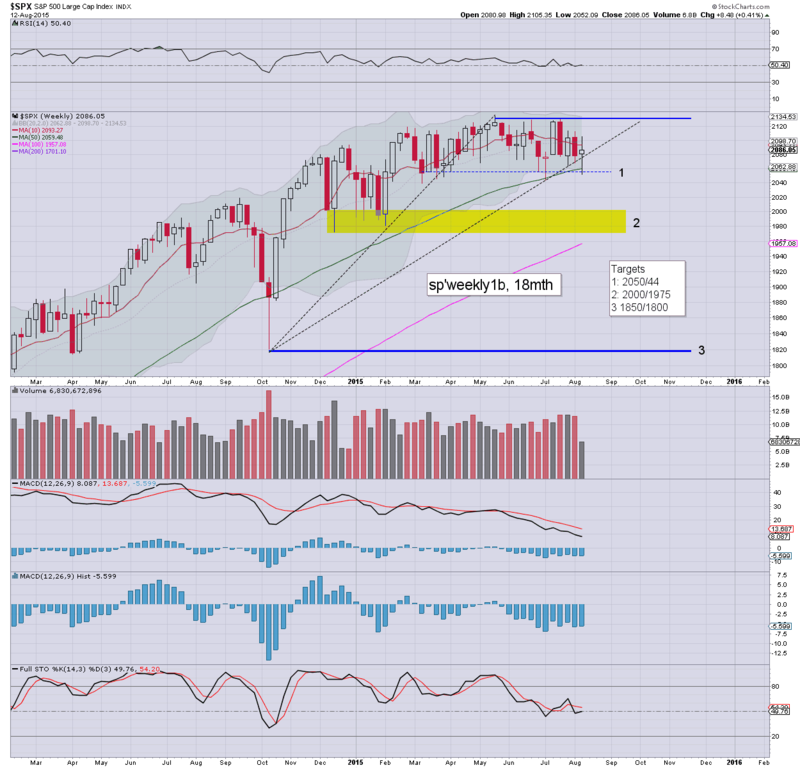 Right now, a weekly close in the 2060s with VIX 16s looks a reasonable target. Certainly, those equity bull maniacs seeking new highs.. with a weekly close above the sp'2100 threshold look set to be disappointed. 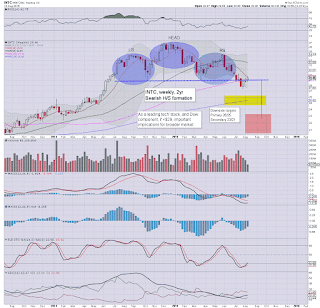 notable weakness: miners, GDX -3.7%, as Gold prices resume lower, -$7. 10.06am.. with sp'2079... . first target is the hourly 10MA of 2073... considering the setup... a daily close in the 2060s now looks very viable.. and that will really spook the bull maniacs buying yesterday. Good morning. Equity futures are moderately higher, sp +7pts, we're set to open at 2093. 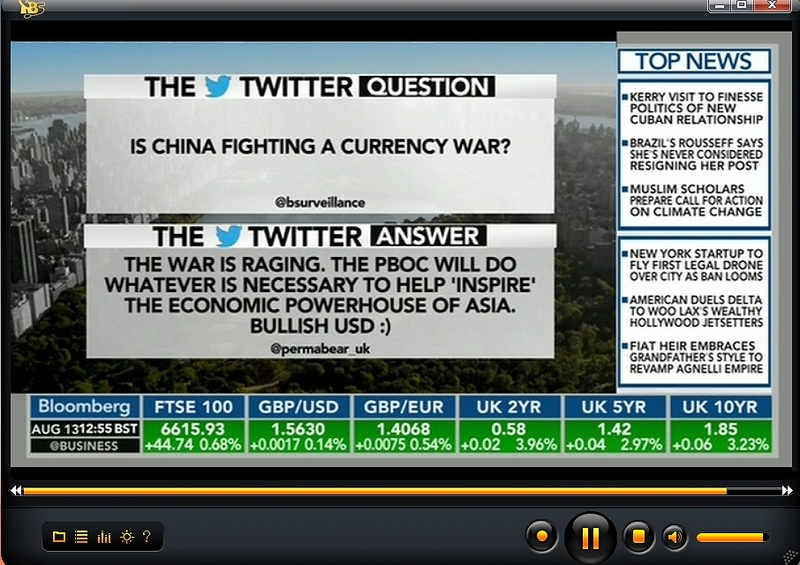 USD is rebounding, +0.3% in the DXY 96.50s. Metals are naturally weak, Gold -$7, whilst Oil is broadly flat in the $43s. So, we're set to open a little higher. 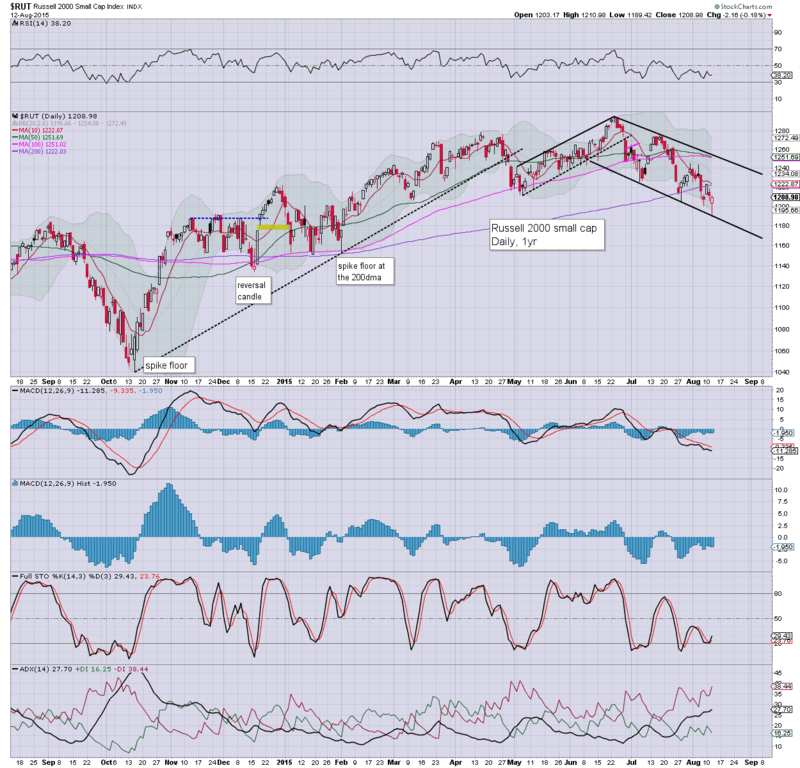 Again, now its a case of whether the market puts in another lower high.. or can break above.. and close in the sp'2100s. Considering recent price action.. and broader price structure on the weekly/monthly charts, I expect the market to rollover and break lower to the 2050/40s within the next few days. 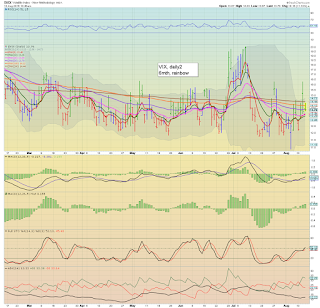 *I am rather heavy long-VIX from the mid 14s. Overnight China action: moderate chop for much of the day, but climbing into the close, the Shanghai comp' settled +1.8% @ 3954. The 4K threshold is obviously proving to be tough to close above. 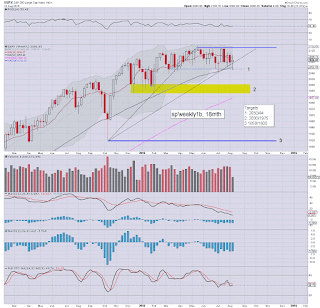 The 3200/3000 zone still looks highly probable. 8.30am.. Retail sales: 0.6% (-0.3% previous) vs 0.5% expected. Futures remain unmoved.. sp +5pts.. 2091.
notable weakness: Oil, -1.0% in the $42s. 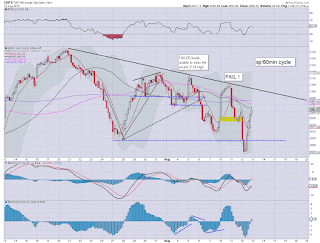 A break under the March low of $42.41 would really help the equity bears. First target would be 40/39... and eventually... 35 or so. At that level, even OPEC might finally agree to supply cuts at the next meeting in December. 8.54am... Cramer appears on clown finance TV, looking like he has been removed from suicide watch. After all... yesterdays second sig' opening decline really did spook the cheerleaders. 9.03am... sp' u/c.... set to open 2086. It won't take much to see the 2070s today. 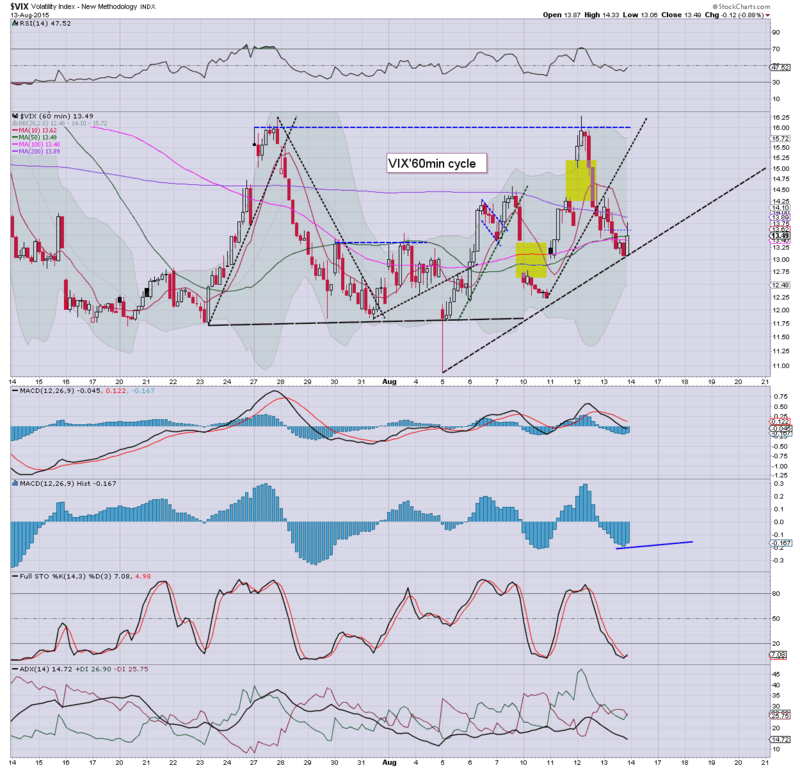 Things only get interesting again on a break into the 2060s... along with VIX 15s. It was a pretty wild day in the US equity market with the sp' breaking a new cycle low of sp'2052 (with VIX 16.28), but then a rather powerful rally... hitting 2089 (VIX 13.45). Despite the daily close, the bigger weekly cycles continue to swing in favour of the equity bears. Things are starting to get interesting! Lets start with this thought... remember the situation as of the Monday close? Many were touting 'new highs are due', after what was a powerful day of equity gains. Yet.. we've just seen two consecutive days where the market really did start to unravel. Despite today's close, there is more technical damage being done every day. I would refer anyone to individual stocks like AAPL or DIS, both are arguably key indirect warnings of trouble in the broader market. Both were once invincible stocks... relentlessly bullish.. but have decisively broken trend/support, and are headed much... much lower. Even though the VIX settled the day essentially flat, there was a key break above resistance (mid 14s), and the bigger daily/weekly cycles remain bullish VIX in the near/mid term. 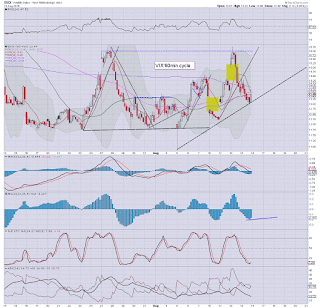 Many are now agreed the VIX is headed into the 20s.. the only issue is whether it will occur in the near term... or not until late Aug/September. 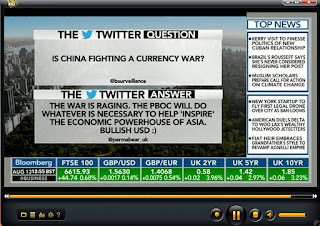 Thursday will see the PBOC issue a press release (10am Beijing time, I believe) with more details on what they want to do in the currency markets. In terms of data: weekly jobs, retail sales, import/export prices, business invent'. Retail sales have been a major disappointment this year - not least after energy/oil prices have remained broadly low. Market is expecting a m/m gain of 0.5%. If that number comes in negative - as it did in July, then the equity bulls are going to face renewed problems tomorrow. For yours truly, it was a tough.. but good day. 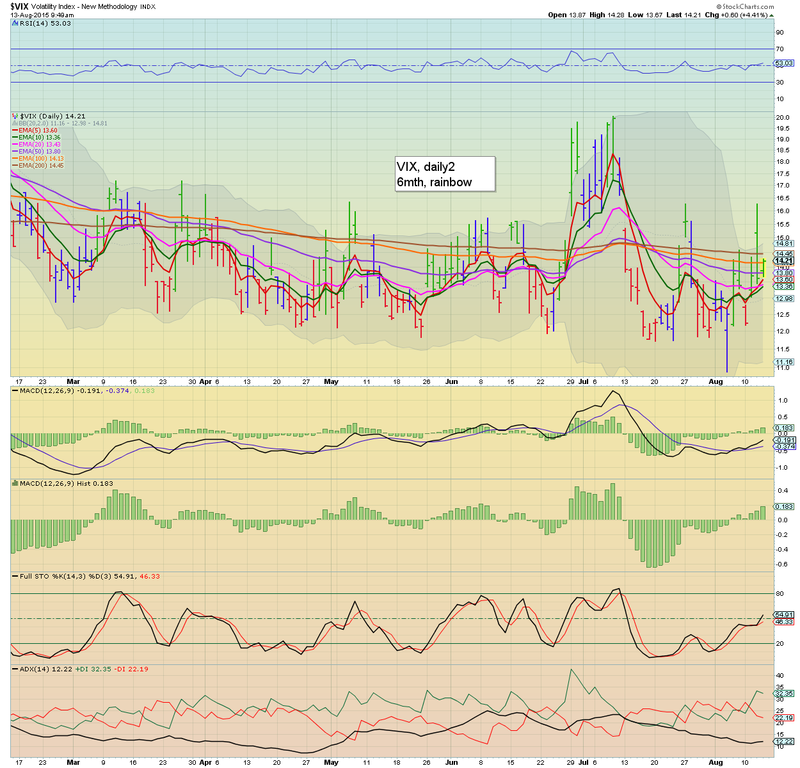 I managed an essentially perfect VIX exit (from 16.20).. and with that exit, I also dropped an INTC-short. Intel has been surprisingly stronger than expected, and even though I still anticipate much lower levels into September.. I am glad to be rid of that one. Arguably, we have a bear flag forming on the bigger weekly cycle. First downside remains the 26/25s. 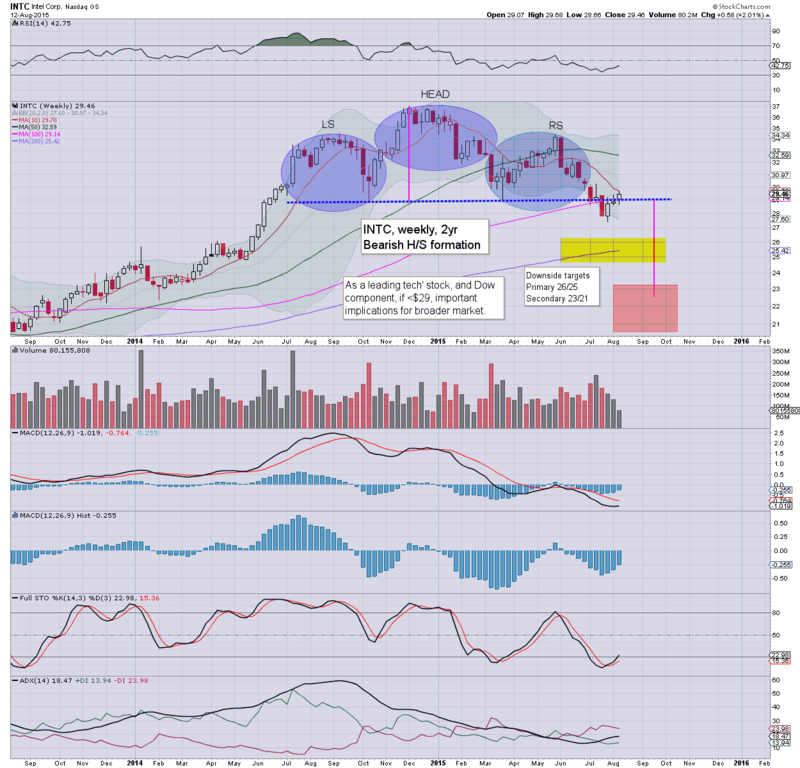 If H/S scenario is correct, then INTC is headed for the $22s... which would be suggestive of sp'1800s. I do like the company in the longer term.. and I'll probably look to go long in another 6-7 weeks. 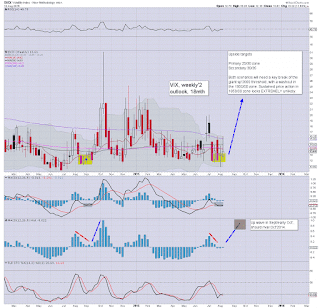 VIX is where the big money will likely be made across the next few months. I'm anticipating the sp'500 will lose the key 2000 threshold, and that should lead to a strong (if brief) VIX spike into the mid/upper 20s. Whether we'll see the 30s.. very hard to say. My broader outlook is for renewed market upside in Q4, but a year end close much above the recent high of sp'2134 looks really difficult.... even if the Fed start threatening QE.... and you know they have Bullard on standby with a pre-drafted press release, right? 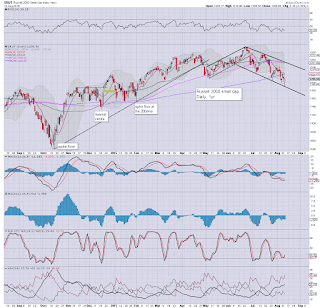 US equities settled moderately mixed, sp +2pts @ 2086 (intra low 2052). The two leaders - Trans/R2K, settled lower by -0.5% and -0.2% respectively. 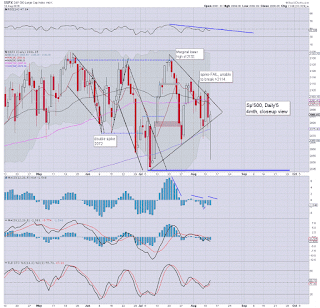 Near term outlook is for renewed weakness, with a target of the sp'2040s and VIX 17/18s. *the daily reversal candle on the R2K bodes in favour of the equity bulls, but broadly, the R2K is putting in a series of lower highs.. and lower lows. It was a pretty wild day in the market, with the sp' flooring at 2052 in the market, peaking at 2089, and settling at 2086. No doubt some will be calling for new highs into the autumn, but then... those same people were getting overly excited on Monday afternoon when the sp'500 was trading @ 2105. 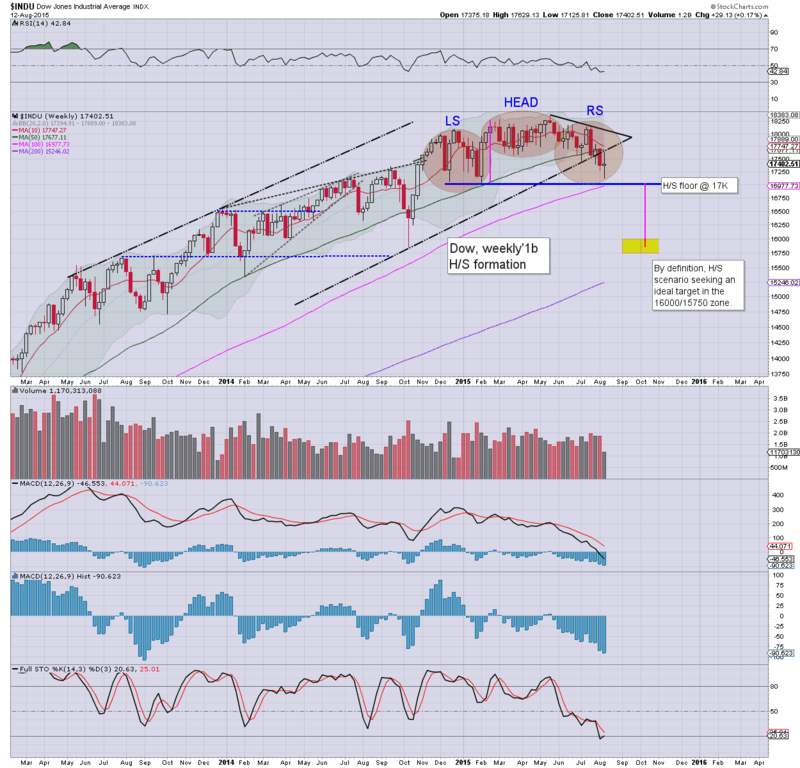 Nothing has changed, the broader outlook is for increasing equity weakness into next month.